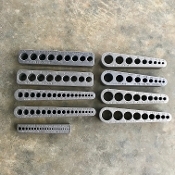 STI (Screw Thread Inserts) V-TapGuide is made to guide oversized ground threaded taps made for the outside diameter for the screw threaded inserts needed for the called out bolt size. Standard taps will not work with the STI V-Tapguides. The STI V-TapGuide is offered in Coarse or Fine Thread Sizes. All V-TapGuides guides have a Lifetime Warranty and are 100% USA made. Each tap guide comes with a FREE plastic storage case. We have been featured on As Seen on TV, and have won multiple innovation awards for our 90° “V-groove” design that runs through the entire guide. This “V-groove” is found on the bottom of the tap guide and ensures perpendicular alignment on round and cornered material. Ground base feature allows use on flat surfaces. The hole sizes and hole alignment marks are permanently embedded onto the guide to allow quick and explanatory tap sizes. Please let us know if you have any questions about our V-TapGuides!